WASHINGTON (AP) – President-elect Donald Trump has chosen former Campaign 2016 rival Ben Carson to become secretary of the Department of Housing and Urban Development. Carson has been coy about joining the new administration, saying shortly after Trump’s election victory that he wasn’t certain he’d fit into a Cabinet-style role. The discussion at that time centered on speculation that Carson might be selected to head the sprawling Department of Health and Human Services. Carson was among the 16 Republican candidates who challenged Trump for the Republican nomination. He was a favorite of religious conservatives and a strong fundraiser, but his team burned through money quickly and he failed to win any of the early primary contests. Trump treated Carson harshly during the primary, saying he had a “pathological temper.” Still, Carson quickly endorsed Trump after he dropped out of the contest. As a Trump supporter, Carson was both loyal and critical. He conceded that Trump had “major defects” and said at one point that he would have preferred a scenario other than Trump winning the Republican primary. Last week, Trump announced that he planned to nominate former Goldman Sachs executive Steven Mnuchin as his Treasury secretary and billionaire investor Wilbur Ross to lead the Commerce Department. He chose Betsy DeVos to be secretary of education and Elaine Chao, the wife of Senate Republican Leader Mitch McConnell, to be transportation secretary. Trump also has turned to retired Marine Gen. James Mattis to be secretary of defense. A retired neurosurgeon, Carson has often recounted his childhood as the son of a single mother in inner-city Detroit in his books and motivational speeches. 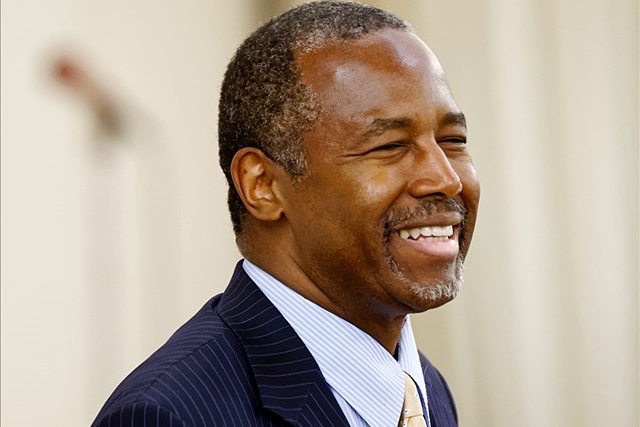 In his 1996 autobiography “Gifted Hands,” Carson wrote of the humiliation he felt using food stamps from his mom to pay for bread and milk, and said how he began to excel at school only after receiving a free pair of glasses that allowed him to see the lessons written on chalk boards. Carson has not said whether his family ever lived in federally-funded housing or received Section 8 subsidies to help pay rent. But as a political figure he has criticized such public assistance programs for creating “dependency” on the government among low-income minorities. “I’m interested in getting rid of dependency, and I want us to find a way to allow people to excel in our society, and as more and more people hear that message, they will recognize who is truly on their side and who is trying to keep them suppressed and cultivate their votes,” Carson said in a speech at the Conservative Political Action Conference in 2015.